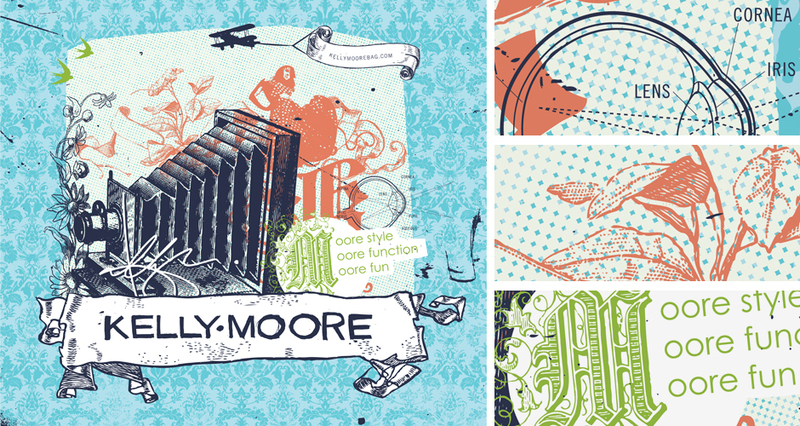 Above is a Tote Bag design for Kelly Moore Bags. As a bag designer, Kelly is constantly looking for something new, stylish, and different. She wanted to offer a tote bag that would grab peoples attention during a trade show to draw people to her booth. Since Kelly was going to give away the tote for free (for marketing), she wanted a design that would reflect who she was, as well as peak the interests of those seeing the tote. Kelly admired the reusable totes seen at Trader Joe’s and thought that would be a great starting point. The final design featured above is very similar to “Trader Joe” style, except it completely represents Kelly, her personality and the many different things and people she loves.